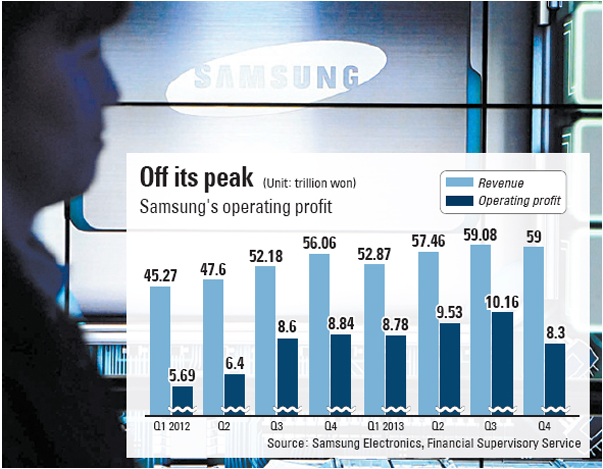 As reported today in the Joongang Daily, Samsung Electronics operating profit in the fourth quarter of 2013 fell by 6 percent, largely because of the declining profitability of the company's "cash cow" smartphone business. (click on the accompanying graphic to see a larger version) This marked the first profit decline in nine quarters and was attributed to "...slowing growth in sales of smartphones and tablets in developed countries, an overly strong local currency and higher marketing costs compared to arch-rival Apple." The article also noted that "Disappointment in the earnings of Samsung Electronics, which accounts for 20 percent of Korea’s stock market capitalization, wasn’t totally unexpected. But the scale of the decline was a surprise, and the company’s shares dropped 0.23 percent from the previous day." Globally, more than half of all mobile phones being sold these days are smartphones. However, Samsung is facing increased competition not only from Apple, but also from other manufacturers of Android devices, notably in China. Also, smartphones like other computing devices are modular and becoming increasingly commoditized. As noted in an earlier post, companies like Google are looking into "build your own" or "design your own" mobile phones. Such technological and economic trends suggest that the challenge for Samsung is part and parcel of the next big hurdle for South Korea, to lessen its heavy dependence of manufacturing and exports by large chaebol industry groups while increasing its strength in software, services and content. This has been the subject of numerous posts, including this short one last October. Gartner's latest projections underscore the urgency for Korea of making this transition. 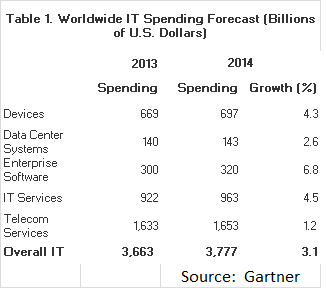 As shown in the accompanying table, the three categories of enterprise software, IT services and telecom services together account for 78 percent of projected worldwide IT spending for 2014, while all the hardware devices together, including smartphones, make up only 18 percent of the total. In light of Samsung's large influence on South Korea's export-led economy, it is probably appropriate to suggest that its challenge to shift from emphasis on hardware to a more balanced approach that includes software innovation is an imperative. That imperative, in turn is at the heart of the Park Geun-hye administrations emphasis on digital convergence as a basis for realizing the "creative economy."